I received an advanced copy of this book from The New York Review of Books through NetGalley. I invite you to read my review and scroll down to the end of the page to win a copy of your own. Open Internationally. The format and style of this book is nothing short of genius. Because of his deafness, Beethoven would use conversation books to communicate in the last years of his life. His friends and family would write their parts of a conversation in the books and he would respond orally. CONVERSATIONS WITH BEETHOVEN attempts to reconstruct the conversation book from the last year of his life. These conversations with the great maestro portray a man who was irascible and paranoid. He believed that all women had loose morals that would give you a disease. He constantly accused people in his life of trying to poison him or steal from him. He had an explosive temper and those around him would often try to calm him down and make him stop shouting. Beethoven’s paranoia resulted in several hilarious exchanges between himself and his family members. There are many funny conversations between Beethoven and his brother Johann in which Beethoven is accusing Johann of stealing from him or Beethoven is telling Johann that his wife is sleeping around. The conversations also reveal a touching side to the composer, who was thoroughly devoted to his family and always passionate about writing music. His nephew Karl, whom he adopted after the death of his brother, gives him many reasons for worry and heartache. Throughout all of the trials and tribulations with Karl, the affection and attention that he gives to his nephew never wanes. Beethoven also has several devoted assistants and friends that he cares for greatly. 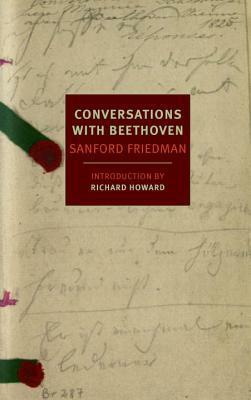 The unique style of the conversations lets the reader see, in their own words, the genuine affection that friends, family and acquaintances had for Beethoven. If you read one new book this fall then it should be CONVERSATIONS WITH BEETHOVEN. The New York Review of Books had issued yet another great reprint that will allow a new generation of readers to enjoy and appreciate Sanford Friedman’s work. I enjoyed this book so much and I know you will too so I have decided to do a giveaway. If you would like to win a copy leave a comment below telling what is the most unique book (style, content, really anything) that you have read. I will choose a winner on 9/5. US/Canada can choose a hardcopy or Kindle edition from Amazon. Open Internationally as long as you can receive an Amazon Gift Code for the book. The winner of the giveaway is Carolyn M. Thanks to everyone for the great comments and book suggestions! Night film was unique narrative clips from newspapers so well written&unusual. Thanks for stopping by and giving me the suggestion! Sounds intriguing! Thanks for the suggestion! The most unique book that comes to mind is The Lover’s Dictionary by David Levithan. I thought it was super clever and fascinating. Hi Courtney! Thanks so much for stopping by. I love it when a book has a unique format. My first thought was The Selected Works of T.S. Spivet, by Reif Larsen, which is unusual primarily in its layout — there is minutiae in the margins that has to be read with a magnifying glass. However, I’m also looking forward to reading The Inner Side of the Wind, by Milorad Pavic, which retells the myth of Hero and Leander in two stories, one set in the 1700s and one set in the 1900s. I understand their stories begin at the ends of the book and meet in the middle. It does sound interesting. I have been particularly drawn to musician’s biographies lately. Even when the music isn’t the direct focus of the work, as in this case, with the Conversations with Beethoven, the artist is so closely bound with the man (or woman), any insight into that person’s light and character makes one think of the music too, and all it costs the person to produce it at a high level. I think that’s exactly why I liked this one so much. It focuses on Beethoven as a human being who faces some serious struggles which most people don’t know about. This book especially highlights the fact that his deafness is particularly frustrating for him. But despite his disability he still continues to write music. Unique book? probably the Pinocchio illustrated by Sara Fanelli, who filled the book with her amazing collages. She is a unique artist. I reviewed it here, where you can see the cover: http://fictional100.wordpress.com/2014/03/29/glorious-romp-sara-fanellis-illustrated-pinocchio/ She mixes drawings, photos, graph paper, wallpaper, and other bits and pieces in a way I found to be uniquely charming and so appropriate for Pinocchio! Thanks so much for sending the link! Very unique! That sounds so interesting. I am really curious about the notes in the margins. Do they have special messages that affect the reading of the main text? They do. The narrator is a child prodigy who maps everything, particularly things that can’t be mapped, so the minutiae is in large part reproductions of his maps. Sometimes his heart is revealed in the map in a way that can’t be done in words. A unique novel which was captivating was Invisible Ellen since the characters were unusual and the relationship unlikely. The most unique book, that I have read, has to be the play,”Tamara”, written John Krizanc about the painter Tamara de Lempicka.and the Italian poet Gabriele D’Annunzio.It is unique for a play, since you don’t sit in a seat to view the play. You actually follow, whatever character you chose, throughout a whole mansion. As a result, you (the audience) actually become a silent actor in the play itself.I was lucky to see one of the first productions, when it was produced at Dundurn Castle,an historic museum, in Hamilton, Ontario, after it’s initial debut in Toronto, Ontario. From there, it had a long run in Los Angeles.It was an experience, I will never forget.If you ever get the chance to see a performance, don’t miss it! I’d have to say THE BOOK THIEF by Markus Zusak. Being narrated by death was certainly unique. I’ve never read that book, thanks for the recommendation! Thanks for the chance to win Conversations with Beethoven! That sounds like an interesting book combining the epistolary style with a fable. Thanks for the recommendation.